Fallout from release of emails of convicted aides damages Wisconsin governor’s presidential prospects. The political and pundit class loves to identify “outsider” candidates for the presidency, looking in particular to governors who have not been tarnished by the compromises and corruptions of Washington. But the trouble with being an “outsider” candidate is that, eventually, you face the same sort of scrutiny as the insiders. Just as New Jersey Governor Chris Christie suffered a blow when the media started to examine the extent to which he mingled politics and governing, so Wisconsin Governor Scott Walker is now taking a hit that will inspire serious doubts—even among his admirers—about whether he is ready for the political prime time. The release of 27,000 pages of e-mails from the seized computers of a former Walker aide who has since been convicted of political wrongdoing, along with more than 400 documents from the first of two major probes into scandals associated with Walker’s service as Milwaukee County executive and his gubernatorial campaigns, is shining new light on the extent to which the controversial governor’s legal, ethical and political troubles will make his transition to the national stage difficult. The e-mails offer a powerful sense of how Walker and his aides appeared to have blurred the lines between official duties and campaigning when he was seeking the governorship in 2010—taking actions that would eventually lead to the convictions of key aides. Walker, who has steered hundreds of thousands of dollars from his campaign account into a legal defense fund, has not been charged with wrongdoing himself. But the e-mails and legal documents paint a picture of an elected official who was so focused on political positioning that he felt it necessary to order daily conference calls to "better coordinate" between aides in his Milwaukee County Executive office and campaign staff. Walker’s county aides used a secret e-mail routing system to coordinate campaign events and fundraising, and to trash the woman who would eventually serve as Walker’s lieutenant governor as “the bane of your existence.” They circulated crude, sometimes racist messages. And as news outlets sifted through the e-mails, they found one from a top Walker appointee, administration director Cynthia Archer, telling another aide who had accessed the secret network that she was now “in the inner circle.” “I use this private account quite a bit to communicate with SKW…” wrote Archer. Scott Kevin Walker identified himself on e-mails as “SKW.” Indeed, among the thousands of e-mails released Wednesday was one from a top Walker aide—Tim Russell, who has since been convicted and hailed. In it, he forwards a link to video of Chris Christie yelling at a reporter with the line: "skw should talk like this." The largest paper in Wisconsin, The Milwaukee Journal Sentinel, which endorsed the governor in the past, featured a banner headline on its Thursday edition that read: "Records Link Walker to Secret Email System." At the same time, the Republican Governors Association—which is chaired by Christie—made a six-figure television ad buy in Wisconsin to protect the governor’s position in a 2014 re-election race where polls show him leading but with support levels below 50 percent. The e-mails and documents—which media outlets have sought for months—were released by a judge dealing with ongoing legal wrangling over the conviction of former Walker aide Kelly Rindfleisch for misconduct in public office. Rindfleisch did not just work for Walker before he was elected governor. She was also associated with him after he took his state post, as a key fund-raiser who traveled with the governor while he raised money nationally. And her name has been linked to a new John Doe probe that reportedly has focused on wrongdoing by individuals and groups that backed the governor’s 2012 campaign to beat a recall vote. That’s not exactly “old news.” And it comes at a particularly unfortunate moment for Walker, who cannot have been happy with a Wednesday Washington Post headline that read: “Scott Walker, eyeing 2016, faces fallout from probes as ex-aide’s e-mails are released,” and “E-mails may spell trouble for Scott Walker.” Or a Thursday New York Times report that said the emails and documents portray Walker as "having presided over an office where aides used personal computers and email to conceal that they were mixing government and campaign business." 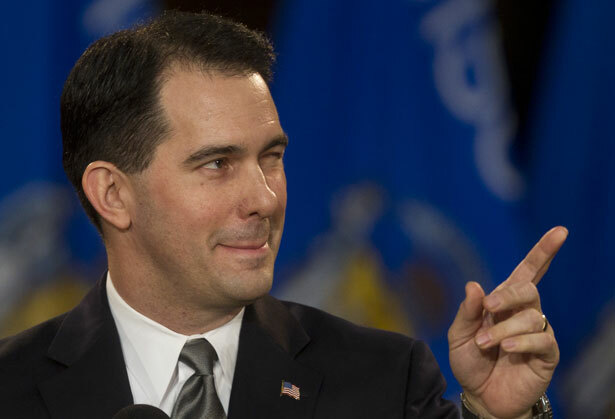 There’s no question that Walker wants to be considered as a contender for the 2016 Republican presidential nomination. Even as he seeks re-election this year, he has been busy touring a new book that conservative commentators say “reads like one gigantic presidential trial balloon,” making the rounds of the same talk shows once frequented by Christie, and maintaining a relentless schedule of national appearances to aid Republican candidates and raise money. With one-time GOP front-runner Christie mired in scandal, pundits who don’t know much about Walker like to imagine that he might be the next “shiny penny” for Republicans seeking a candidate from outside Washington. But Walker’s national prospects have never looked as good as his admirers imagine. Even after Christie’s downfall, the Wisconsinite was wrestling with Louisiana Governor Bobby Jindal for last place in most state and national polls of likely Republican caucus and primary voters. Now, just as Christie faces fallout from an aide’s revealing e-mails, so Walker faces fallout from an aide’s revealing e-mails. The circumstances may be different, and Walker has certainly tried to present himself as a less politically contentious figure than the governor of New Jersey. But when the headlines in Washington are talking about a governor facing “fallout from probes,” and the governor in question is not Chris Christie, there’s a good chance that even the most ardent Republicans will start noticing the tarnish on their shiny penny.